A review article on the the effect of Psoriasis on the U.S economy was published online by JAMA Dermatology. The authors reviewed factors that have a direct, indirect, intangible and comorbidity (presence of one or more additional disorders) costs of adult psoriasis and estimate that the annual U.S. cost of psoriasis for 2013 to be between $112 billion and $135 billion. 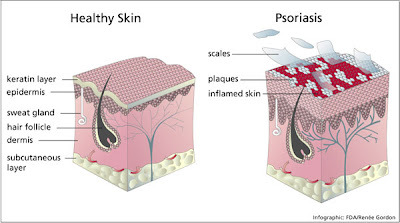 Psoriasis is a chronic inflammatory skin disease. It causes the skin to be irritable and form thick, red skin with flaky, silver-white patches called scales. These scales are dead skin cells that form on the surface. The disease occurs when the immune system mistakes healthy skin cells as a threat and attacks it. It sends out a signal to speed up the growth of new skin cells. Dead skin cells builds up on the skin surface which become scales. By releasing an estimated annual cost of the Psoriasis, researchers believe it will help develop cost effective therapies that will help alleviate this economic burden and improve patient outcome. The annual U.S. cost of psoriasis, a chronic inflammatory skin condition, was estimated to be between $112 billion and $135 billion in 2013, according to a review article published online by JAMA Dermatology. Psoriasis affects about 3.2 percent of the U.S. population and understanding the economic burden of the disease is important for research, advocacy and educational efforts. Elizabeth A. Brezinski, M.D., of the University of California, Davis, Sacramento, and coauthors reviewed 22 studies to estimate the direct, indirect, intangible and comorbidity costs of adult psoriasis. The results were adjusted to 2013 dollars. Their review found direct psoriasis costs ranged from $51.7 billion to $63.2 billion, while indirect costs (due to absenteeism or going to work while sick) ranged from $23.9 billion to $35.4 billion. Medical comorbidities were estimated to contribute another $36.4 billion. And intangible costs (to eliminate the negative effects of psoriasis in physical and mental health) amounted to a one-time cost of up to $11,498 per patient with psoriasis, according to the review results. "The direct health care costs are significantly greater for patients with psoriasis than for the general population and are also higher for patients with increasing psoriasis disease severity. ... Defining the economic burden of psoriasis from a societal perspective is the foundation for innovating and providing access to cost-effective therapies that will result in improved patient outcomes," the authors note.